"Coconut Dates".I found this recipe on net.Just want to share with all date lovers.Serve cold. Fry the almonds in little oil until golden brown, then place them on absorbent paper towels for a few minutes to absorb any excess oil. Melt butter in a heavy based sauce pan. Add dates and ground cardamom. Wet your palm and place a small amount of date mixture in the centre of your palm and shape into a smooth ball. 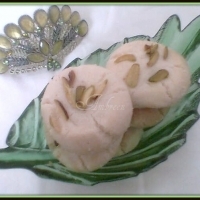 Indent the centre with your thumb and press an almond into it. Fold the sides and reshape into an oval or date shape. Repeat with remaining date mixture. Roll each date in the desiccated coconut and arrange on a serving dish. 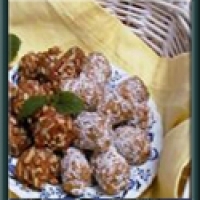 great recipe again,i luv dates,will surely try this,thanx!keep up d good work! Is this your posting??? Oh my.... I did not see this recipe was from my friend Ambus... ( You changed your picture dear...) thanks to send me this recipe!!! I sent to you 2 messages inbox, tell me if you got them!